With spring just around the corner, it’s time to tend to those trees and flowers. But you’re not the only one racing to those fruits and flowers — birds might get to your garden before you do. One way to deal with those angry birds is by making your own scarecrow. You don’t have to buy one; you can make a craft out of it! A scarecrow doesn’t need to say “Halloween.” The intention is to scare the birds away, not your neighbours. You can use anything from your own home and clothes collection. Think of it as a decorative element in your back or front yard. First and foremost, you need an old broomstick to use as a body. It is preferable to leave the bristles attached for a hat to rest on and to use for a face. 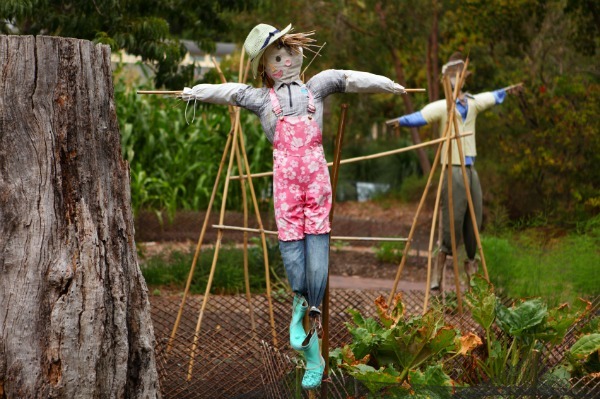 Use the other broomstick to create arms and give your scarecrow structure, by glueing and tying it to the main broomstick in a cross shape. For the clothing, use any old rags that you have lying around: an old T-shirt, dress shirt or dress will do. Try to stick to cotton or other non-slippery materials. Pretend that the bristles are the head and place the shirt on. Tighten it at the back and glue it down the broomstick with a glue gun so it doesn’t fly away on windy days. Now that the scarecrow is dressed, start to make it look more human. Use black or brown yarn and glue it to the ends of the bristles, taking the shape of shoulder-length hair. It doesn’t need to look neat or trendy; it is meant to look like crazy, messy hair. Use any hat that you no longer need and glue it at the top. (Again, it is important to glue it in so it does not fly away.) You can draw in eyes with a marker or sew or glue on buttons. You can use old gloves and staple them to the sleeves — just get creative! After you’re done, it’s time to secure your scarecrow in the ground. Dig into a soft area (water the ground first, if necessary) of your garden and “plant” the scarecrow. Make sure to sink the broomstick at least halfway into the ground and secure it well with earth, to prevent it toppling over.